On 14th November 2013, Mr. Milind Deora in the presence of Shri Kapil Sibal, Shri Sharad Pawar and Shri Rajeev Shukla released a special commemorative postal stamp in the honor of the cricketing legend Sachin Tendulkar at Mumbai’s Wankhede stadium. This was the day when Sachin set out to play his 200th test which also happened to be his farewell game. 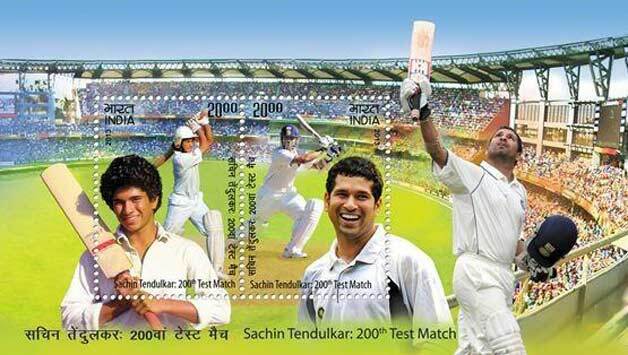 The stamp featuring the icon’s portrait was released at the presentation before the start of the match. The Department of Posts which falls under the Ministry of Communications and Information Technology in collaboration with Mumbai Cricket Association (MCA) had decided to issue the stamp in Sachin’s honor. The Ministry made a rare exception as Master Blaster became the only the second living person after Mother Teresa in whose honor a stamp was issued.